Hale Mea Ala perfectly mixes the breathtaking views of the Kauai southern coast with the luxury of the Kukui'ula private community. Hale Mea Ala is a true work of art that maintains a Polynesian appearance while balancing luxury and comfort. Minimal. Modern. Elegant. 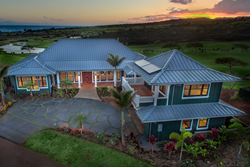 Brenda Crawford, ranked #1 on the South Shore and West Side of Kauai with Coldwell Banker Makai Properties, has listed a 5 bed, 5.5 bath luxury home in the private community of Kukui'ula for $7.25 million. Built in 2016 the 5 bedroom, 5.5 bathroom residence and garage apartment comprises 3,544 square feet. Over 5,000 square feet under roof. Stunning 270 degree view of the southern coast of Kauai overlooking holes 5 and 6 of the famed Tom Weiksopf golf course. Inside the impeccably planned Kukui'ula private community which includes an 18-hole golf course, world renowned spa, epicurean dining and state of the art club house. Kukui'ula is known as Kauai's Living Garden. Designed by award winning architect Gary Nogle and Jan Solomon, Hale Mea Ala is a true work of art that maintains a Polynesian appearance while balancing luxury and comfort. Minimal. Modern. Elegant. Truly Island style, this single level home is wrapped in a view well worth the price of admission. Intentionally perched high within the Kahalawai neighborhood's mountain slope, the house faces directly into the limitless blue Pacific with side-by-side fairways, white sand traps and pristine water features in the balance. The house overlooks beautiful Holes 5 & 6 of the famed Tom Weiskopf golf course at Kukui'ula. Countless tropical flowering plants and trees historically used in Hawaiian Lei making--plumeria, puakenikeni, tuberose, and Princess Ka'iulani's favorite, pikake--release their intoxicating fragrance into the wind. Oversized Pella casement windows on the windward side open to expansive pocketing lift & slide doors along the entire leeward side of the home to create a well-flowing indoor meets outdoor sanctuary of over 5,000 square feet in total. Overhead rustic oak beamed vaulted ceilings stand tall in opposition to the Du Chateau engineered wood flooring throughout both living structures. Duplicate ocean-view master suites, each opening onto a portion of the gracious ipe wood deck. Clawfoot soaking tubs can be found in both master suites. The modern farmhouse style gourmet kitchen and casual dining room enjoy fabulous air flow and refreshing ocean views. The kitchen is finished with Caesarstone counter tops, Wolf hood and range, paneled Sub Zero refrigerator, wine fridge and ice maker. The 5 bedrooms include customized closets, private ensuite bathrooms, Carrara marble slab counter tops, tile shower and floors along with 4 connecting outdoor lava garden showers. Additional property information can be found on a dedicated website at https://www.halemeaala.com/. EDITORS NOTE: Property photos, aerials and additional market statistics are available upon request.